My Christmas series has begun and I hope you enjoy the ideas for your holidays; David Lebovitz says that this ice cream goes wonderful with holiday desserts – and I believe him – but you must know that it goes well with just a sprinkling of freshly ground nutmeg, too. Warm the milk, sugar and salt in a medium saucepan. Pour the cream into a large bowl and set a mesh strainer on top. In a separate medium bowl, whisk together the egg yolks. Slowly pour the warm mixture into the yolks, whisking constantly, then scrape the warmed egg yolks back into the saucepan. Stir the mixture constantly over medium heat with a heatproof spatula, scraping the bottom as you stir, until the mixture thickens and coats the back of the spatula. Pour the custard through the strainer and stir it into the cream to cool. Mix in the nutmeg, brandy, rum and vanilla and stir until cool over an ice bath – I just let it cool over the counter, then refrigerated it. Chill the mixture thoroughly in the refrigerator. Once the mixture is cold, taste it and grate in more nutmeg if you wish. Freeze in your ice cream maker according to the manufacturer’s instructions. Eggnog ice cream has to be the best invention ever. <3 Next weekend, this will be made and it will be loved. 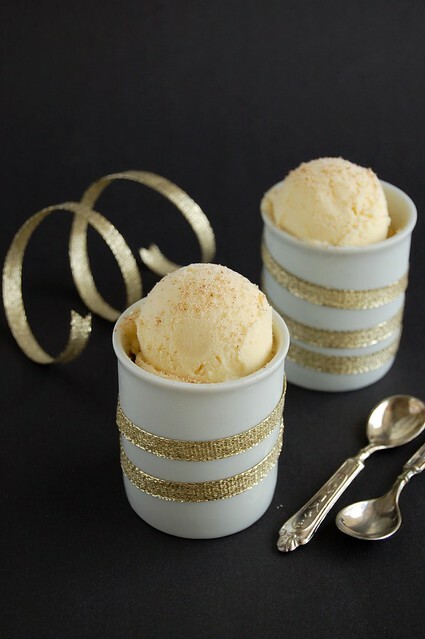 Eggnog was never my favorite Christmas drink, but I think the idea of adding it to ice cream is genius! Your picture looks awesome too! Mmm this sounds fab. Makes me think of the killer eggnog my boyfriend's stepmom makes. this is real beauty, Pat! I've never tried eggnog, but this looks too good not to try! Great idea! And the photos are really good! My husband LOVES egg nog (but I've never actually had it. Weird, huh? He buys it; I let him drink it!) But ice cream? I'd give that a shot! good god that sounds good! This, I think, might be better than eggnog itself! oh my - egg nog and icecream. How can you go wrong. I have a huge container of eggnog at home and going to make this. YUM!